Is it possible to set objects to scale in some way as you zoom in and out? Some objects are challenging to see at extremes of zoom. For instance, lines can be too thin to see when zoomed way out but become way thick when zoomed in. ... I would refrain from using such an option. Changing the stroke width depending on the zoom would most likely trick you into thinking that your image looks different than it actually does. For working with very thin or thick lines, you can temporarily change to View → Display Mode → Outline. SVG elements can have the property vector-effect="non-scaling-stroke", see documentation. 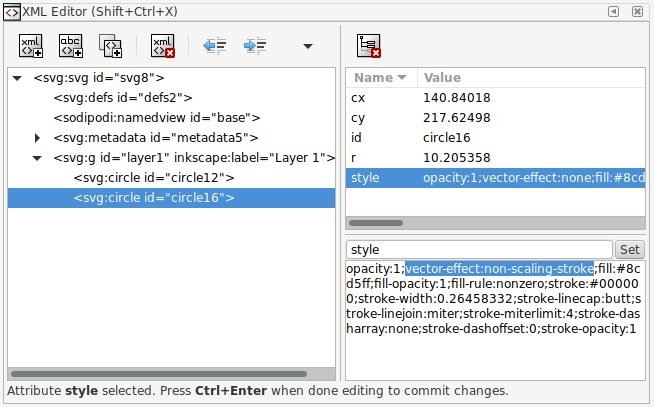 Inkscape respects that property, but you have to add it manually using the xml editor. Under style, change vector-effect:none to vector-effect:non-scaling-stroke. Here are screenshots of an example image. There are two filled circles with a stroke of width 10px. Only the blue circle on the right has the property vector-effect:non-scaling-stroke. The following screenshots were made at different zoom levels. For better comparison of the stroke width I copied small parts of all screenshot and pasted them right next to each other. As we can see, the blue circle keeps its stroke width for all zoom levels. 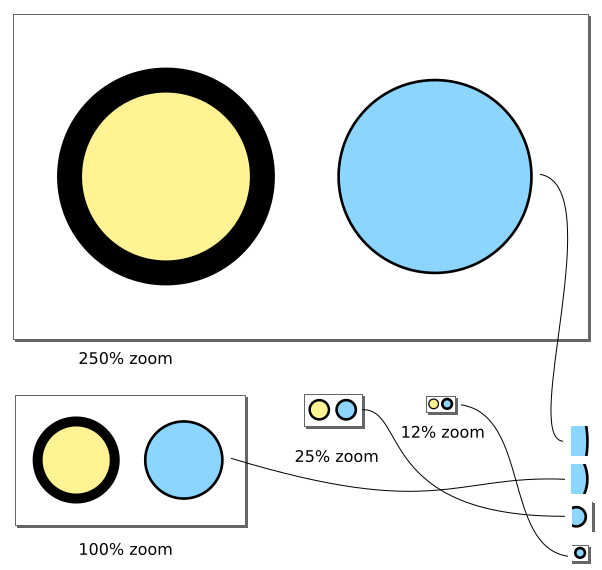 In the example from above both circles have the same stroke width, but at zoom level 100% the yellow circle's stroke is thicker. Seems like a bug in Inkscape. I use version 0.92.2 2405546, 2018-03-11 on Linux. You should change non-scaling-stroke back to none after you are done editing. Not all applications support it. Not the answer you're looking for? Browse other questions tagged inkscape zoom or ask your own question. How I deactivate Alt + Scroll zoom in Adobe software programs?